Outside it is not much to look at, little more than a discoloured rock dredged up from the sea floor. But an x-ray scan of the object, actually a pocket watch recovered from a 17th century shipwreck, has revealed that the internal mechanism has been perfectly preserved. The computer aided tomography system used was sensitive enough to pick out the tiniest details, included the engraved name of the master watchmaker, one Niccholas Higginson of Westminster, London (Gizmodo). As if more proof were needed that they don’t build them like they used to, a UK group has started collecting donations to build the first fully working version of Babbage’s “Analytical Engine”. The original design, dating from 1837, was never completed, possibly due to a combination of the strict engineering tolerances needed and Babbage’s notoriously prickly temperament. If the final machine works as advertised, it will be very strong confirmation of the claim that Babbage designed the first general purpose, programmable computer (BBC News). Meanwhile, in Slovenia, Borut Povse and his team are busy teaching a modern descendant of Babbage’s design to hit people. Somehow Povse has convinced six volunteers to let an industrial robot hit them on the arm with various sharp or blunt implements in an effort to determine how much pain each blow causes. Obviously this has a beneficial use in that robots can be programmed not to exceed certain levels of force near a human obstacle, but will also be of immense interest to the machines during any future robot uprising (New Scientist). Another robot out to supplant humans is HRP-4, a gynoid (female android), that has learnt to sing by copying the inflection and expressions of a human performer, right down to the breathing. The hope is to make robots behave in a more convincingly natural way, and so overcome the so called ‘uncanny valley’. From the video, it looks like they’ve still got a way to go (Daily Mail). Madison Avenue! Home to brilliant, canny advertising geniuses, who can convince millions of people to buy or believe anything! And then again, even Homer nodded. Yes, it's true. 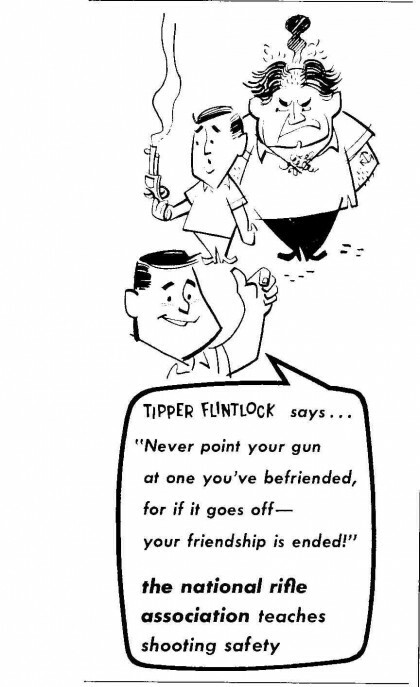 Back in 1962, some genius of a press agent thought the image of the National Rifle Association could be improved by creating a cartoon spokesman who would offer rhymed messages about not accidentally offing your friends.